Ursula Newell Gestefeld was an influential early New Thought teacher and healer. Ursula was born in Augusta, Maine, to an invalid mother. Ursula herself was also a sickly child and it was assumed that she would not live to see adulthood. But Ursula went on to marry and had four children. By 1878, she and her husband, Theodore Gestefeld. Ursula and her family eventually moved to Chicago, Illinois where her husband started working as a reporter for the Chicago Tribune. Ursula was already middle-aged when she first heard of Christian Science,after a friend had loaned her a copy of Science and Health by Mary Baker Eddy. Ursula began religiously applying the Christian Science healing principles to her own life, and after 3 months without the help of medical treatment, achieved a restored state of health. Her success led her to become a believer and also a leader in the Christian Science movement. When Mrs. Eddy came to Chicago for an instructional class, Ursula became a member of her class. Mrs. Eddy soon recognized Ursula as a person of outstanding ability and welcomed her warmly to the new faith. Ursula soon began practicing and teaching Christian Science and establishd herself as a metaphysician, and also taught the principles of mental healing in Chicago. In 1888, Gestefeld started writing and publishing books. Gestefelt went on to publish a book under the title, "Ursula N. Gestefeld's Statement of Christian Science," and although she had given full credit to Mrs. Eddy as its founder, it eventually caused Eddy to denounce Ursula Gestefelt in the Christian Science Journal and practically cut her off from her movement. Ursula reacted vigorously to Eddy's attack upon her and wrote a caustic pamphlet under the title Jesuitism in Christian Science. Although Gestefelt was expelled from the Christian Science association, she would go on to launch an independent career of healing and teaching. She soon became recognized as a leader in the metaphysial movement which later came to be called New Thought. Ursula N. gestefelt established herself and her work mainly in Chicago, publishing books and magazines and maintaining a center and a church to spread her ideas. Around this time she developed a system which she called Science of Being, and also formed the Exodus Club, a non-sectarian group ;the Exodus Club would eventually evolve into a church which Ursula named. "The Church of the New Thought". It was here where she trained other women to become certified leaders, teachers and pastors. 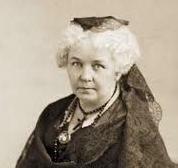 She was also founder of the Illinois Woman's Press Association. In 1895, Gestefeld contributed to The Woman's Bible, which summarized the Science of Being principles. At this time, she also started her monthly magazine for the New Thought movement called Exodus, serving as its writer, editor and publisher. Bu the turn of the century, Ursula Gestefeld expanded her mental healing theories to include wealth and prosperity. She was a frequent speaker in many metaphysical movement congresses, and also served as a member of the Executive committee of the Metaphysical League. Gestefelt was also present during the formation of the first International New Thought Alliance in London in 1914, and she continued to lecture and write throughout the 1910's. She passed away of toxemia in 1921. Hymnary - Ursula N. Gestedeld - "Out of Egypt, Called by Thee"